Brazilian epic pagan black metal band Iron Woods from São Paulo is back after many years of silence. The idea for the band was conceived in 2001 by Holykran and took flesh in 2002 when Guerriera Nox (drums) and Hammer (bass) joined him. As a trio the band released its debut full-length album “Ancient Faith” in 2004 and its second work “The Journey to the Paganism” in 2008, both self released. Now, 5 years later, they return as a duo (Hammer left the band) and they released two works in the end of 2013! The full-length album “Iron Woods” and the 3-track EP “Death Hail and Glory!“, both out via the Brazilian label Mutilation Productions. Iron Woods haven’t changed their style, but they have improved a lot their sound. Everything is more natural now, especially the metal orchestrations. Their music is a combination of epic metal with pagan black metal, influenced by the best bands of the genre. Rhythmic battle guitar riffs, accompanied by epic melodic synths, acoustic guitars, flutes and a great canvas of wonderful vocals, ranging from pagan black metal screams to epic clean male vocals, few guest female vocals, many choral refrains and background choirs. “Iron Woods” includes 2 instrumental tracks (intro and outro) plus 6 long epic songs, with a total album duration a little over 56 minutes. The compositions are all very beautiful, with interesting structures and many amazing melodies, especially as the album evolves. The mood of the songs changes from epic Viking oriented metal to more ancient pagan archaic atmospheres. Tranquil acoustic passages, nature sounds and soundtrack-like interludes make the whole result even more interesting. In the second track “Iron Woods” there is also an adaptation of Basil Poledouris classic “Anvil of Crom” from “Conan the Barbarian” movie theme! My favorite track is the pagan metal masterpiece “Pagan Child“, whose intro is taken from the movie “The Secret Garden“. Lyrics of the band speak about pagan, epic, Viking and nature themes, all written in English. 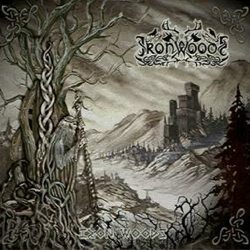 The return of Iron Woods after all these years is a great present for their fans, especially since they released two works. “Iron Woods” and “Death Hail and Glory!” are also the first albums of the band released under a label, so they will get a much better distribution. If you are into epic pagan metal, you better give them a listen. “Iron Woods” is released by Mutilation Productions in a beautiful digipak CD with a 12-page booklet, including all the lyrics. It is also released via Hammerbolt Productions for Europe in a 6-panel digipak edition, limited to 300 copies. Both editions have the same artwork, by Michael Schindler. You can visit the band’s official Facebook profile for more info and many sound samples.